API Manager can generate alerts when specific events occur. It can generate alerts for events relating to managing partner organizations (for example, when an organization is created or deleted), and for events relating to managing APIs (for example, when access is granted to an API). When an alert is generated by API Manager you can execute a custom policy to handle the alert (for example, to send an email to an interested party, or to forward the alert to an external notification system). Sample policies are provided as a starting point for custom development. You can enable or disable alerts in the API Manager web interface. You can change the policy that is executed when an alert is generated in Policy Studio. Alerts are categorized according to the type of event that generates the alert, for example, organization events are in a different category to application events. The following sections list the alerts in each category, and detail the event that triggers the alert, and the type of the alert (governance or runtime). Events initiated by a person (for example, an administrator approves an API consumer registration) are governance alerts. Events that occur during normal operation of the system are runtime alerts. API Manager generates application alerts for events relating to managing applications. Approve Application Registration Governance When a new application has been registered but approval is needed (auto-approve disabled). Application Approved Governance When a new application registration is approved (including auto-approve). Delete Application Governance When an application is deleted. Except when the organization is deleted - do not generate an alert for each application in the organization. Enable Application Governance When an application is enabled. Disable Application Governance When an application is disabled. Approve Application API Access Request Governance When an application is requesting access to an API but approval is needed (auto-approve disabled). Application API Access Approved Governance When an application request to access an API is approved (including auto-approve). Remove Application API Access Governance When authorization to access an API is removed from an application. Enable Application API Access Governance When an application’s API access is enabled. Disable Application API Access Governance When an application’s API access is disabled. API Manager generates API registration alerts for events relating to managing APIs. API Proxy Published Governance API owner publishes API proxy. API Proxy Deprecated Governance When an API proxy is deprecated. API Proxy Retired Governance When an API proxy is retired (unpublished). API Proxy Promoted Governance API owner promotes API proxy. API Proxy Authentication Policy Change Governance Authentication policy of a published API proxy is changed. API Deleted Governance When an API proxy is deleted. API Manager generates API catalog alerts for events relating to enabling and disabling APIs. Enable API Governance When an API is enabled in the API catalog. Disable API Governance When an API is disabled in the API catalog. API Manager generates API consumer alerts for events relating to managing API consumers. Approve API Consumer Registration Governance When a new API consumer user is registered but approval is needed (auto-approve disabled). API Consumer Approved Governance When a new API consumer user registration is approved (including auto-approve). Delete API Consumer Governance When an API consumer user is deleted. Note This alert is not generated for each user when an organization is deleted. Enable API Consumer Governance When an API consumer is enabled. Disable API Consumer Governance When an API consumer is disabled. Reset API Consumer Password Governance When an API consumer password is reset (not changed). API Manager generates organization alerts for events relating to managing organizations. Create Organization Governance When an organization is created. Delete Organization Governance When an organization is deleted. Enable Organization Governance When an organization is enabled. Disable Organization Governance When an organization is disabled. Add Organization API Access Governance When authorization to access an API is granted to an organization. Remove Organization API Access Governance When authorization to access an API is removed from an organization. Enable Organization API Access Governance When an organization’s API access is enabled. Disable Organization API Access Governance When an organization’s API access is disabled. API Manager generates quota alerts for events relating to system or application quotas. System Quota Exceeded Runtime When a system quota is exceeded. System Quota Warning Exceeded Runtime When a system quota warning threshold is exceeded. System Quota Changed Governance When a system quota is changed. Application Quota Exceeded Runtime When an application quota is exceeded (application default quota or application specific quota). Application Quota Warning Exceeded Runtime When an application quota warning threshold is exceeded (application default quota or application specific quota). Application Default Quota Changed Governance When an application default quota is changed. Application Specific Quota Changed Governance When an application specific quota is changed. Application Specific Quota Deleted Governance When an application specific quota is deleted. 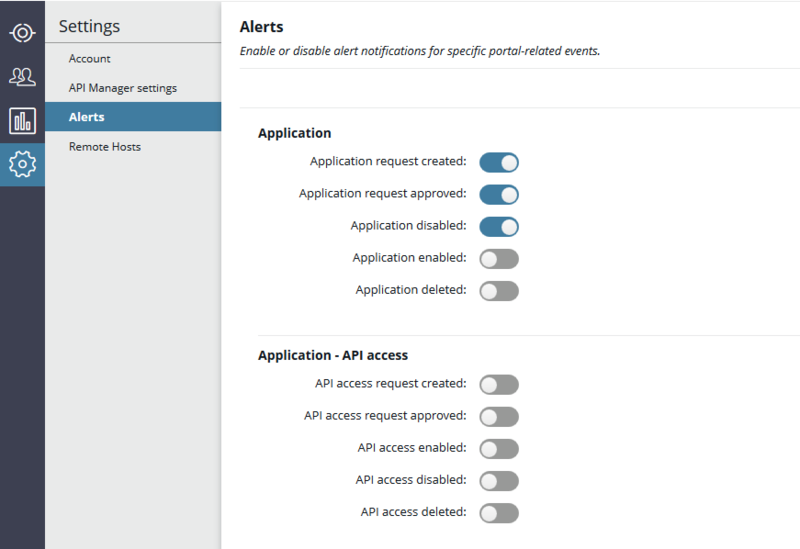 You can enable or disable alerts in the API Manager web interface. Click the Settings > Alerts view in API Manager. Alerts are disabled by default. The following figure shows the view of API management alerts in API Manager. To enable or disable an alert, click the On/Off button next to the alert. Changes are saved automatically. When an enabled alert is generated, the policy associated with that alert is executed. The alert context provides the policy with a number of message attributes. These are specific to the alert being generated (for example, alert.application, alert.appdev, alert.organization). By default, each alert is configured to execute a sample policy, and the sample policy demonstrates the attributes from the respective alert context. You can change what happens when an alert is generated, either by modifying the sample policy associated with the alert, or by creating a custom policy and associating that policy with the alert. 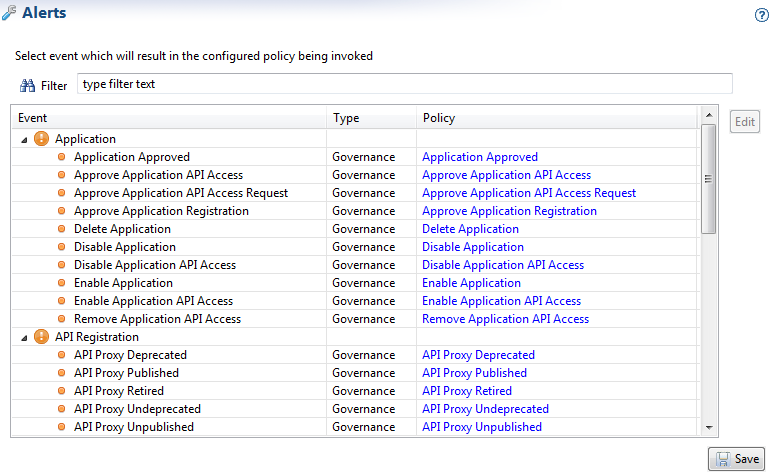 You can change the policy that is executed when an alert is generated in Policy Studio. To view the API management alerts and the associated policies, click the Environment Configuration > Server Settings node in the Policy Studio tree view. On the Server Settings tab, expand the API Manager tree node and click Alerts. The following figure shows the view of API management alerts in Policy Studio. To modify the sample policy associated with an alert, click the sample policy link next to the alert. For more information on configuring policies, see the API Gateway Policy Developer Guide. To associate a different policy with an alert, click the row containing the alert, and click the Edit button. In the dialog, click the browse button to select a new Alert Policy and then click OK. To save any changes, click the Save button.